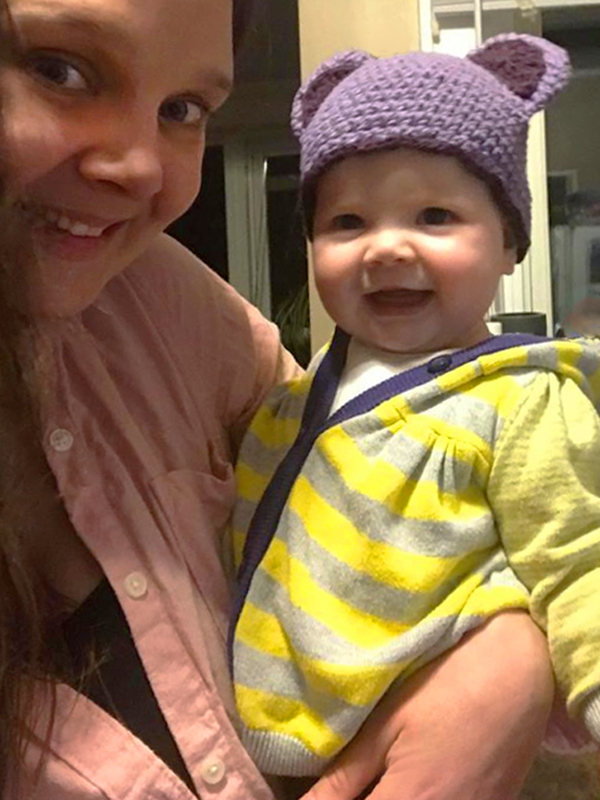 For the crocheters who are reading, this is a post featuring two little hats and one tiny crown that I crocheted for the beloved babes in my life. 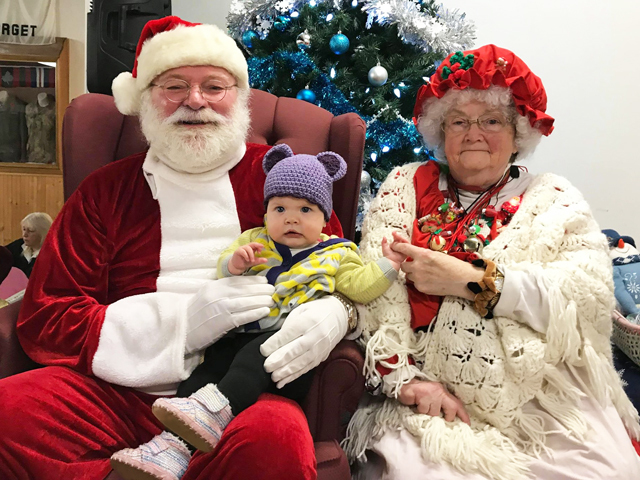 And, for the visitors who don't crochet but enjoy seeing pictures of babies, there are a few of those included here, too. As for those who don't crochet and aren't into baby pics, I'll talk to you later, haha. Please pop back next week, as I have an exciting art related story up next. 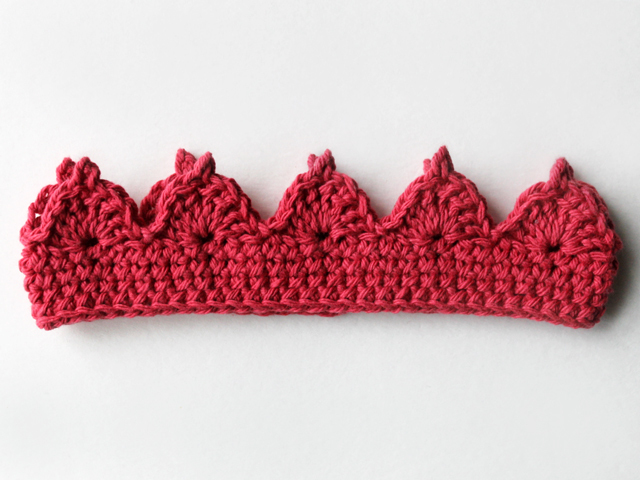 Onto the crocheting : The Crown was created by following a free pattern I found on the internet, exactly as it was written. 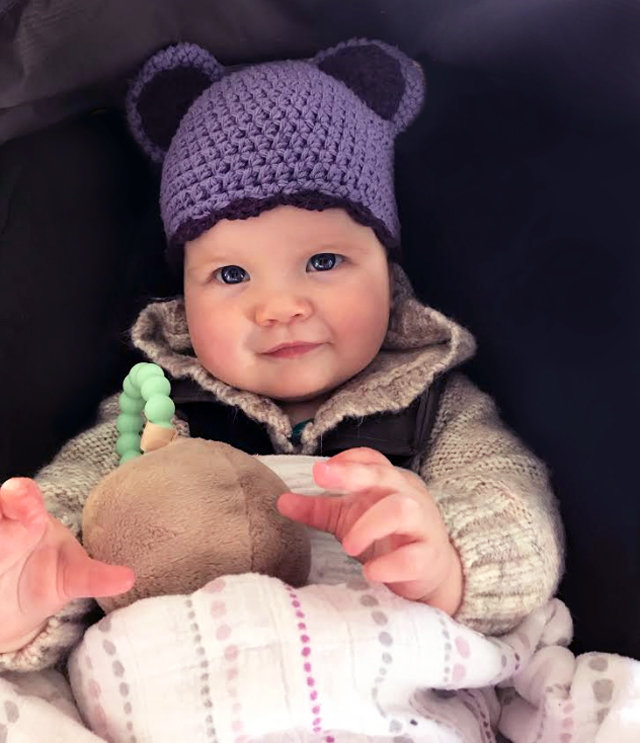 The Hat-With-Ears was made following a free pattern with a couple of added modifications, and the Pompom Toque is a pattern that I developed, which I'm happy to share with you. I chose to make each of these out of cotton yarn, rather than using an acrylic. This is just a personal preference because I love the softness of cotton, however, the two patterns I followed were written for acrylic yarns, and, of course, there are many lovely choices available for those. 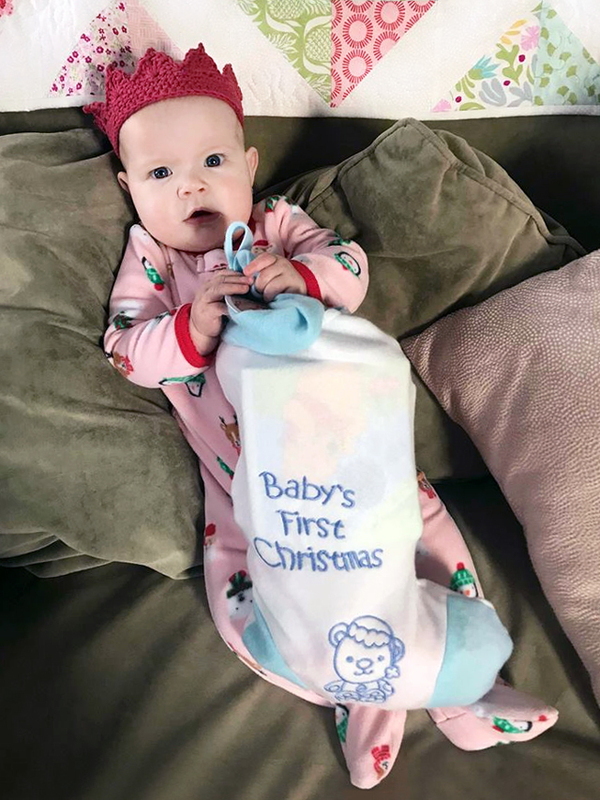 One thing to note is that, if you use cotton, your item will not be as stretchy as one made with acrylic, so it won't fit your baby's head for as long. Let's begin with the crown. This pattern, written by Ira Rott and available as a free download at Ravelry, is a winner! She has included instructions for a whopping nine sizes, beginning with doll-sized and going up to an Adult-Large. 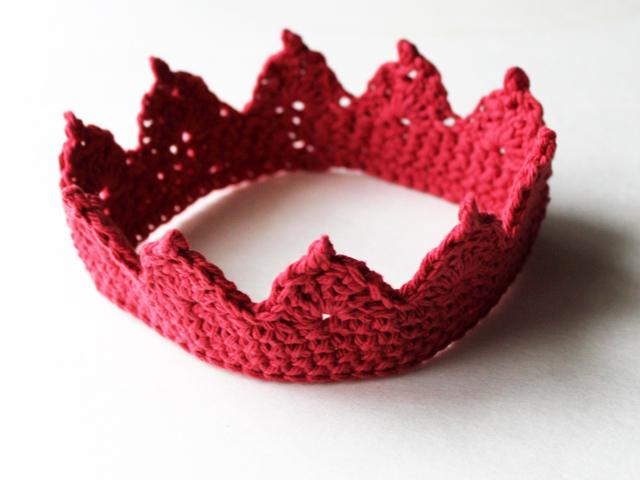 Yes, you can have a crocheted crown for yourself, too. I plan to make one to wear as a headband for when I'm washing my face and putting make-up, because ... well, why not?! I made this one in the size 3-6 months, for a baby girl to wear at 5 months, during her first Christmas season. I chose a soft cotton yarn (Bernat - a medium weight 4-ply in Country Red). It only took a small amount of yarn and about an hour to make, so I'm fine with the fact that, having used cotton, it didn't have much stretch to it so wouldn't fit after her head grew. The important thing is that it fit nicely when she needed it. The second item is a hat with ears. This one was made following this free pattern from Yarnspirations. Again, I used a cotton yarn (Bernat - a medium weight 4-ply in Hot Purple), while they suggest an acrylic offered by the same brand. I made the 6 to 12 month version, but, the use of cotton made it more of a 6 to 10 month fit. 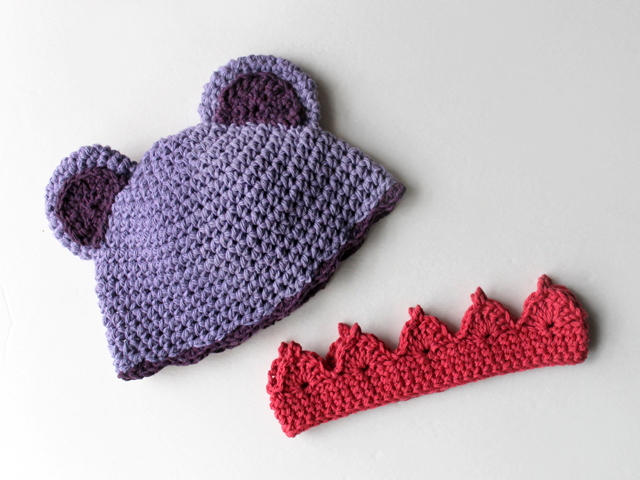 The pattern is fairly easy to follow, but the making of the ears is a bit confusing. Just follow the pattern, word for word, because what they say works! You end up with nice ears that are a double layer thick, so they'll stand up well. After I'd completed the hat, my husband took one look and right off thought I was going for a Disney "Mickey Ears" look. 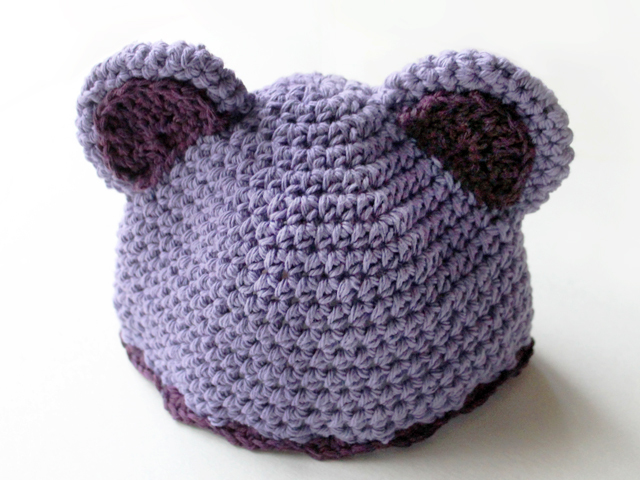 No offence to Disney lovers, but that's not what I'd intended -- I wanted more of a "cute little bear" look -- so I added some deeper purple pieces to the inside of the ears, and a scalloped trim around the bottom. If you, too, would like to modify the pattern in this way, the ear parts were made by crocheting a chain of 8, the final 1 being for the turn. (The length will vary depending on the size of hat you're making, so just make sure you chain an odd number of stitches, creating something long enough to fit within the ear, leaving a border of about 1/2 inch on either side, plus 1 chain for the turn.) Turn and make a single-crochet stitch into each chain - that was 7 on mine. Then make a scallop (half-circle shape) by making 8 double crochets into the middle stitch of the previous row. Anchor your scallop with a slip stitch. Finish by ch1 for the turn and making 2 hdc stitches into the top of each dc from the previous row. Bind off and stitch this half-circle shape into the front layer of the ears on the hat. 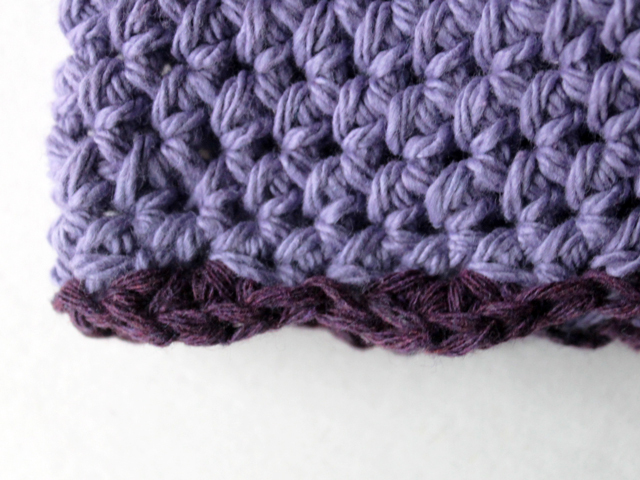 ↑ To make the contrasting coloured scalloped edging around the bottom : attach your yarn, then skip one stitch (of the previous row) and make 4 hdc into the next stitch. Skip the next stitch and anchor the scallop with a slip-stitch into the next stitch. Continue doing that all the way around. 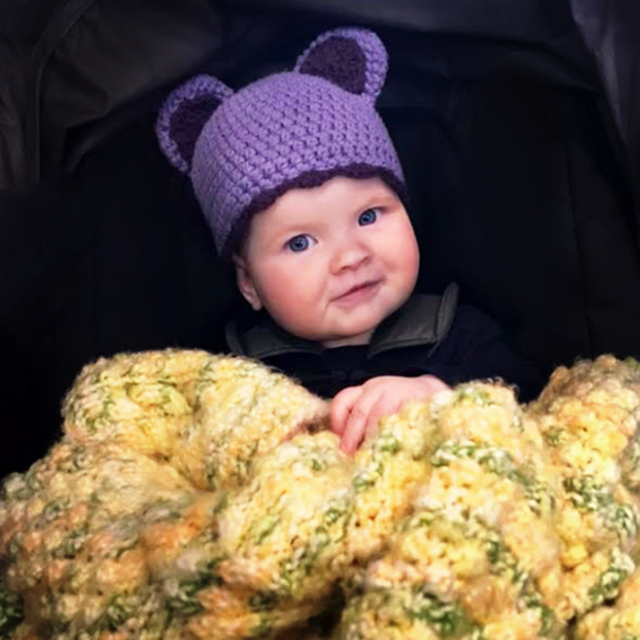 I made the tuque with a pompom on top for a newborn to 3 month old, but the same technique can be used to make a larger hat. Just make each component bigger. The first part of this project are made exactly like I made the larger hat previously described in this post. In a nutshell, you make a ribbed band, stitch it into a ring, crochet along one edge of that, and continue going around and around until you reach your desired length minus a couple of inches. Then you narrow your piece a little bit by eliminating every second chain between stitches, for a couple of rows. Then, eliminate every chain between stitches for a row. Further decrease by doing decrease stitches for every fifth stitch for a couple of rows, until you've reached the desired height. Bind off and cut your yarn, leaving a tail of about 10 inches long. 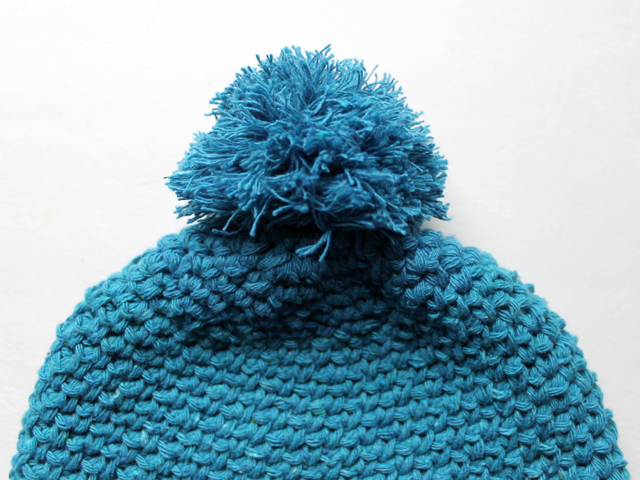 You'll still have a hole at the top of the hat, which you'll cinch shut with the tail of yarn. Thread it though a darning needle and then pass it around the edge of the hole, in and out, all the way around. Then, pull on the tail and the hole in the hat will close up. Use the remaining tail yarn to stitch the cinched hole securely shut. 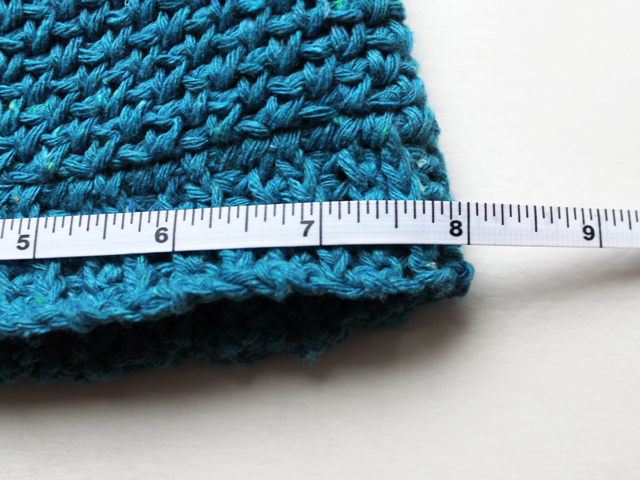 The exact dimensions for the very small version I made are: Chain 7 (6 plus 1 to turn) for a ribbed piece that is 1 inch - 6 stitches - wide. Make the ribbed piece 16 inches long. When you single stitch along the side of the ribbed piece, make 3 ss per repeat of ribs. "Single stitch plus chain" around and around until you reach 5 inches. Decrease as described above. You're finished piece will be about 6 1/2 inches tall before you cinch the hole. 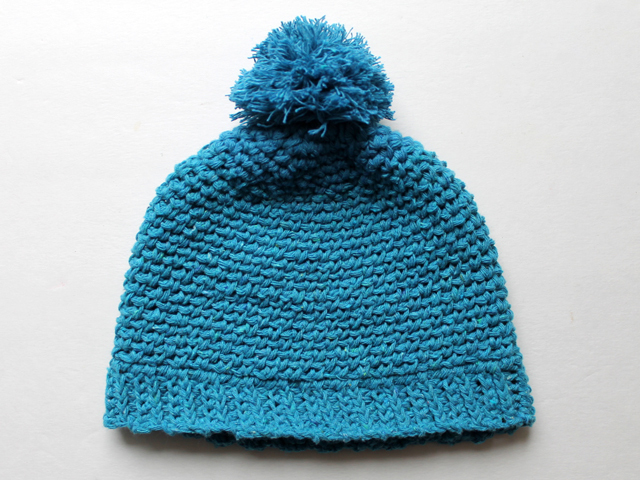 The completed hat, not including the pompom, will be about 6 inches tall and 8 inches wide. 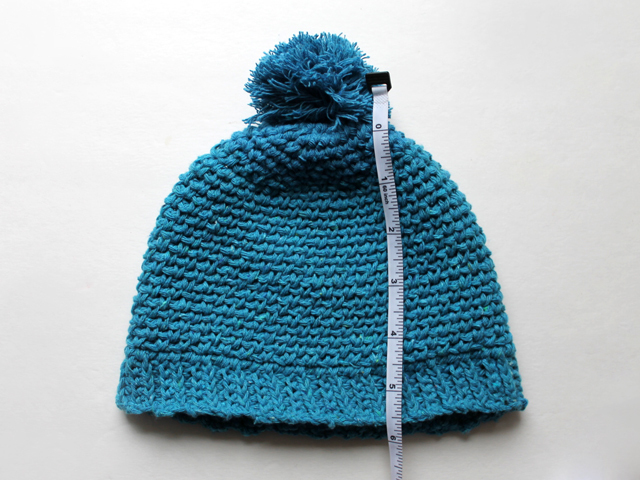 To make the small pompom, use the TP-roll method, (as demonstrated in the previously published hat pattern - linked above), but make your TP rolls smaller, about 1 inch across. Wrap the yarn 70 times. Tie the pompom and clip (as described in that other post). Since this pompom is made of cotton, which has several easily separated plies, fluff up your pompom by separating each strand of yarn into the individual plies. 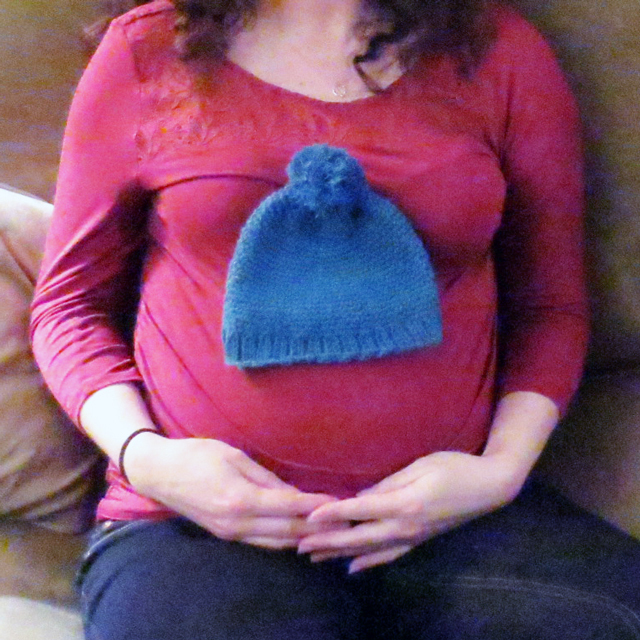 I have no photos of this tiny hat being worn, as we're still at the stage of eagerly awaiting his birth, but I do have this ... It's blurred and pixelated, but you get the idea! Thanks for reading. I hope you'll try making one of these hats or the crown for a child in your life.